Hale’s channels appear to have formed in response to the crater-forming impact event. The impactor is thought to have struck an ice-rich crust. Heat from the impact could have melted subsurface ice, mobilizing liquid water, which then carved the surrounding channels. Hale crater demonstrates the role impact events may have played in supplying the Martian surface with liquid water, particularly early in the history of the Solar System when larger, more frequent impact events were common. Image 3: Context image of Hale crater (center) and surrounding terrain in daytime infrared. Hale crater is located is the rim of Argyre basin, which defines the regional slope-break in the image. 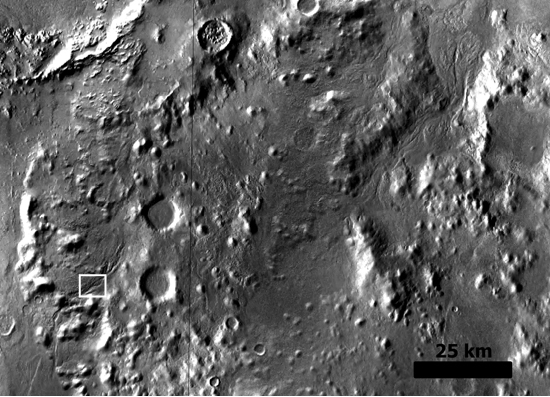 Relatively smooth plains are found outside the basin to the top right of the image; rougher terrain is found on the wall of the basin, which opens to the image bottom left. The black rectangle indicates the approximate boundary of Image 1. Image captured from Google Mars. Hale’s channels are rare, but other impact craters on Mars appear to have associated impact-generated fluvially-modified channels as well, including Mojave (7.6ºN, 327.0ºE), Tooting (23.4ºN, 207.5ºE), Zunil (7.7ºN, 166ºE), and Sinton (40.4ºN, 31.4ºE). 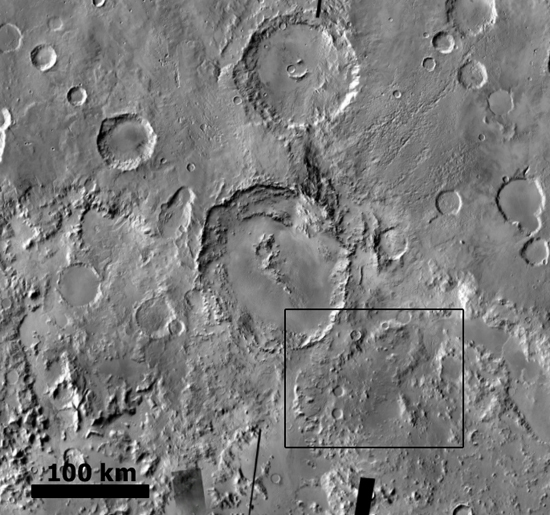 All of the known impact craters with associated channels, including Hale, appear to be very well preserved. It is possible that channels once surrounded other older and/or more heavily modified impact craters, but were then erased or modified over time and are no longer recognizable. As more high-resolution images return from Mars, more evidence of channels surrounding impact craters may be revealed. Herrick, R., Osinski, G. and Pierazzo, E., 2008, Proceedings of the workshop, bridging the gap II: Effect of target properties on the impact cratering process. Meteoritics and Planetary Science, 43: 1915-1916. Ivanov, B.A. and Pierazzo, E., 2011, Impact cratering in H2O-bearing targets on Mars: Thermal field under craters as starting conditions for hydrothermal activity. Meteoritics and Planetary Science, 46: 601-619. Jones, A. P., McEwen, A. S.; Tornabene, L. L.; Baker, V. R.; Melosh, H. J.; Berman, D. C., 2011. A geomorphic analysis of Hale crater, Mars: The effects of impact into ice-rich crust. Icarus 2011, 1, 259–272. McEwen, A. S. and 32 coauthors, 2007. A closer look at water-related geologic activity on Mars. Science 317, 1706–1709. Morgan, G., Head, J. W., 2009. Sinton crater, Mars: evidence for impact into a plateau icefield and melting to produce valley networks at the Hesperian-Amazonian boundary. Icarus 202, 39–59. Mouginis-Mark, P. J., Tornabene, L. L., Boyce, J. M., McEwen, A. S., 2007. Impact melt and water release at Tooting crater, Mars. 7th Internat. Conf. on Mars, 3039. Pierazzo, E., Artemieva, N.A. and Ivanov, B.A., 2005, Starting conditions for hydrothermal systems underneath Martian craters: Hydrocode modeling. Special Paper of the Geological Society of America, 384: 443-457. Pierazzo, E. and Chyba, C.F., 2006, Impact delivery of prebiotic organic matter to planetary surfaces. In: Thomas, P.J. and Chyba, C.F. (eds. ), Comets and the origin and evolution of life137-168. Pierazzo, E., Artemieva, N., Asphaug, E., Baldwin, E.C., Cazamias, J., Coker, R., Collins, G.S., Crawford, D.A., Davison, T., Elbeshausen, D., Holsapple, K.A., Housen, K.R., Korycansky, D.G. and Wainnemann, K., 2008, Validation of numerical codes for impact and explosion cratering: Impacts on strengthless and metal targets. Meteoritics and Planetary Science, 43: 1917-1938. 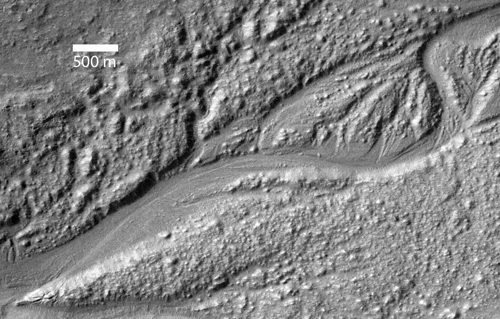 Tornabene, L. L., McEwen, A. S., HiRISE Team, 2008. Recent channel systems emanating from Hale crater ejecta: implications for the Noachian landscape evolution of Mars. LPS XXXIX, 2180. Williams, R., Malin, M., 2008. Sub-kilometer fans in Mojave Crater, Mars. Icarus 198, 365–383.